Yellow House English aims to deliver a bilingual future to children through its programme of home and preschool courses, teacher training, advice for parents online evaluation and communication systems. Download the 2018 brochure today! Can every child be bilingual? How can our children become bilingual? The materials target the highest educational standards and top entertainment production quality so that children will choose to use them at home and at preschool. Yellow House English has offices in the UK and Poland. In other countries, we work with well-established publishing partners. For more details, please send an email to contact@yhe.uk.com. 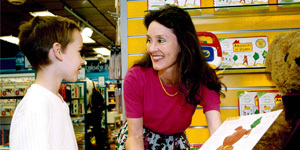 Claire founded the Yellow House English brand in 2000 in response to parents’ requests for materials to help the youngest children learn English. Claire has over fifteen years’ experience in writing series for home and school learning, including courses for Cambridge University Press, Oxford University Press and FLTRP. 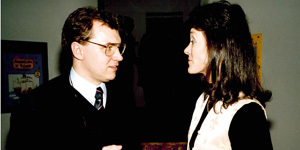 Waldek leads the Polish operation and is a key link to the Bilingual Future Social Education Programme for Yellow House English. His teenagers were among the first children to learn English with YHE in pre-primary over ten years ago! Hubert has been working with the brand YHE for many years. 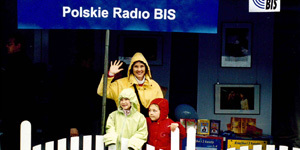 He supports teachers and Local Authorities in Poland with product sales, presentations and administration. Hubert has a young daughter who is already enjoying the Baby Beetles at home! Marcin joined the team in November 2015 to help manage the fast expansion in Poland in the areas of sales, product management and technical support. Marcin’s daughter is a Tom and Keri fan! 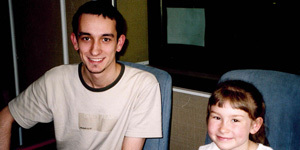 Our 15 year history in pictures! Christmas promotion in Smyk - the series outsells Harry Potter! 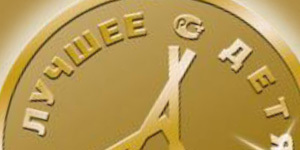 In 2004, the singers return to record the Baby Beetles! In 2009, the Baby Beetles set off, animated at last! The first decade is celebrated in style with the launch of the Baby Beetles animated series at Magdalen College and a concert performance on piano by Zosia Miksa, one of Yellow House English’s first pupils! 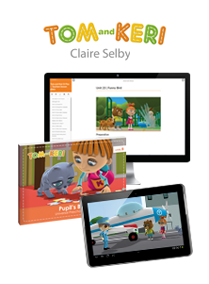 in 2014, both the Beetles and Tom and Keri win joint gold as Children's Product of the Year in Russia! Easy Access for SEN settings. It is a 3 year course for 3, 4 and 5 year old pupils everywhere. 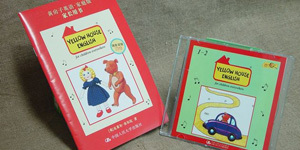 Teachers tell us that the Universal Preschool Course from Yellow House English is just what they have been waiting for! • English in parallel to the home language. 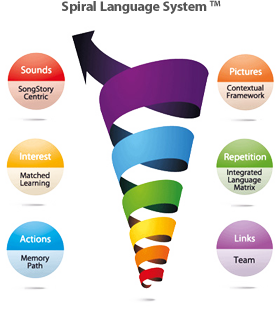 The words and phrases are carefully built into the course structure using my Spiral Language System, nominated for an ELTon award in 2012. Easy access – planned for pupils with learning difficulties to enjoy. Children can become bilingual if they hear and use a language often enough – that’s why all versions provide packs for home and school use. 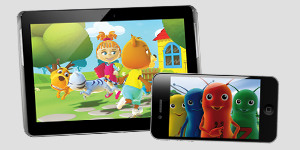 Parents do not need to be experts in English – just encourage, support and press PLAY! 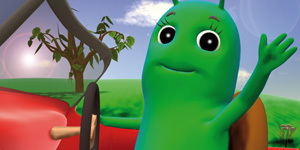 The Starter Level of the Universal Preschool Course features the cuddly Baby Beetles characters, now seen on TV in several countries. 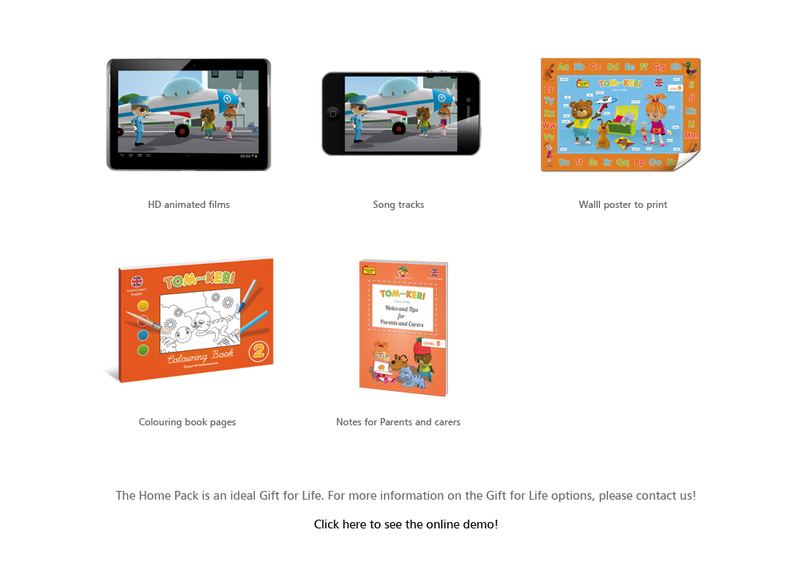 This level is for children starting preschool aged three and offers a Teacher’s Pack, Pupil’s Book and a Home Pack. 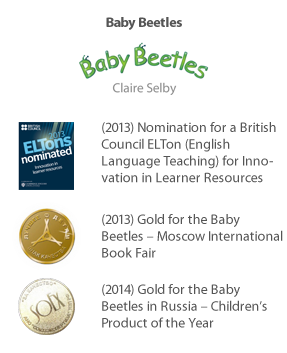 Children enter the world of the Baby Beetles through their animated songs and join in learning English through play – naturally. The triple-pack approach makes sure the pupils are exposed to a little English every day – now shown to be the best way for children to target bilingualism with English. 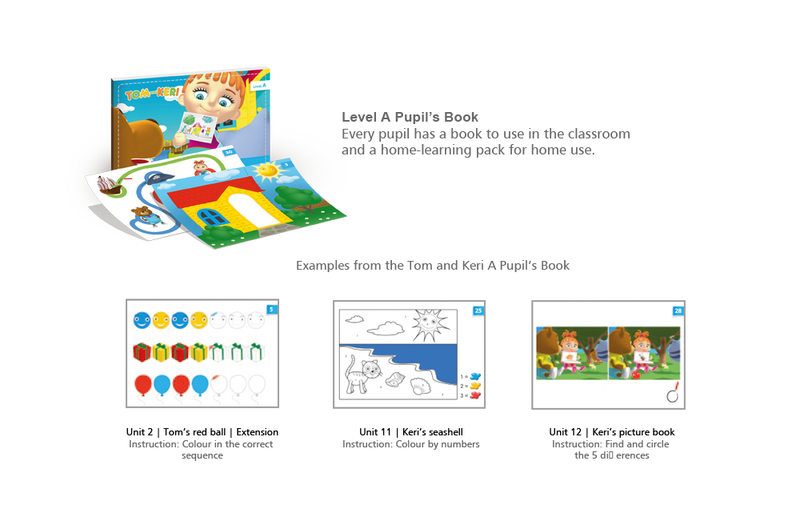 The materials are delivered on- and off-screen so that teachers and parents use the convenience of modern media, combined with the effectiveness of physical teaching tools in the classroom. There is a set of Standard Teacher’s Lesson Plans that any classroom teacher can use to lead activities in English (the course materials present the new words and phrases). 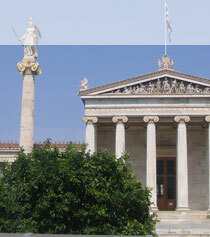 There is a PLUS Teacher’s Lesson Plan pack with advanced lesson plans for qualified English teachers. The course is simple, fun and effective – and to make sure each teacher feels well-prepared, a handbook called How to help your class learn English is available too! 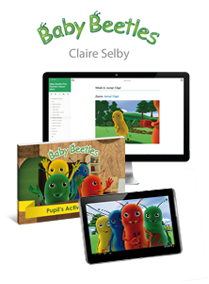 The animated songs in the series present the new vocabulary in the context of the simple adventures enjoyed by the Baby Beetles characters and together they build a clear first-stage syllabus in English for young learners. For pupils starting English at age four, Level A is the place to start. 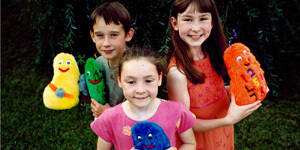 The animated stories with characters Tom and Keri are at the heart of the series. The visual context makes understanding new words and phrases easy and parallels children’s natural learning of language through observation and experience. 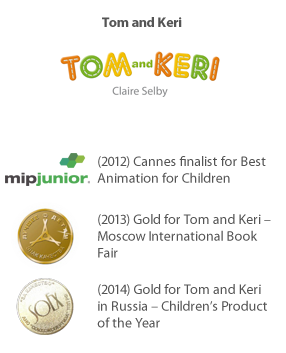 There are 26 Tom and Keri story animations, 13 in Level A and 13 in Level B. 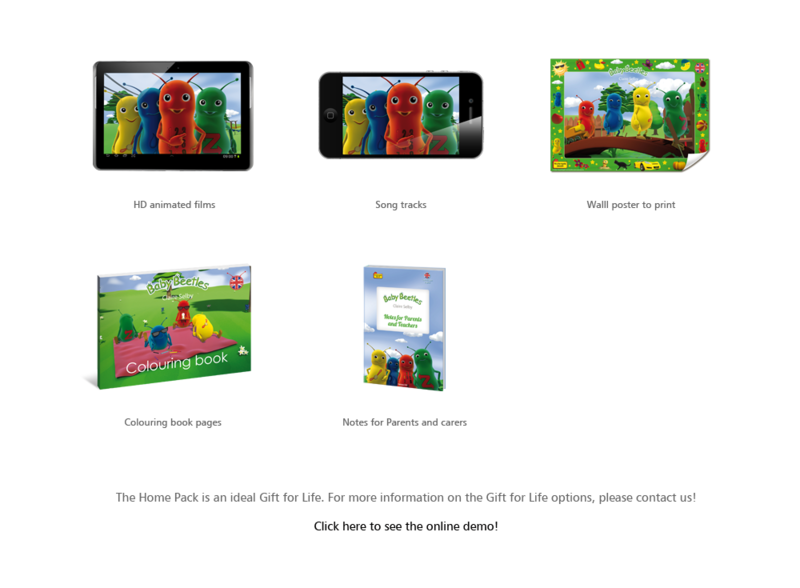 Children watch the animations at home to prepare for the lesson using the Home Pack. 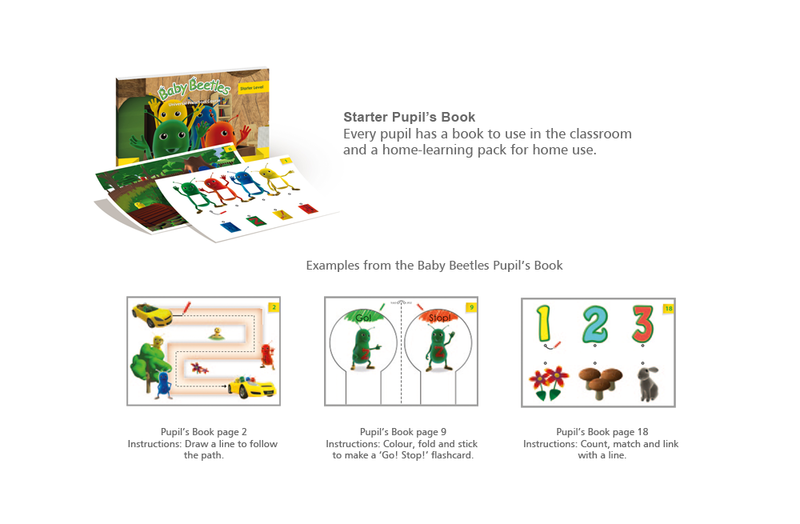 The Teacher’s Pack provides a full set of materials with which to consolidate learning daily through play with songs, games, craft, the Pupil’s Book pages and some mini dramas. Specially prepared Language Presenter film clips present new vocabulary in the context of each story for the classroom teacher and invite the pupils to join in. These short films set the scene for each lesson and give class teachers a ready resource filmed with a native speaker. Extra online resources make this course rich in content and flexible enough to fit a wide range of school timetables. 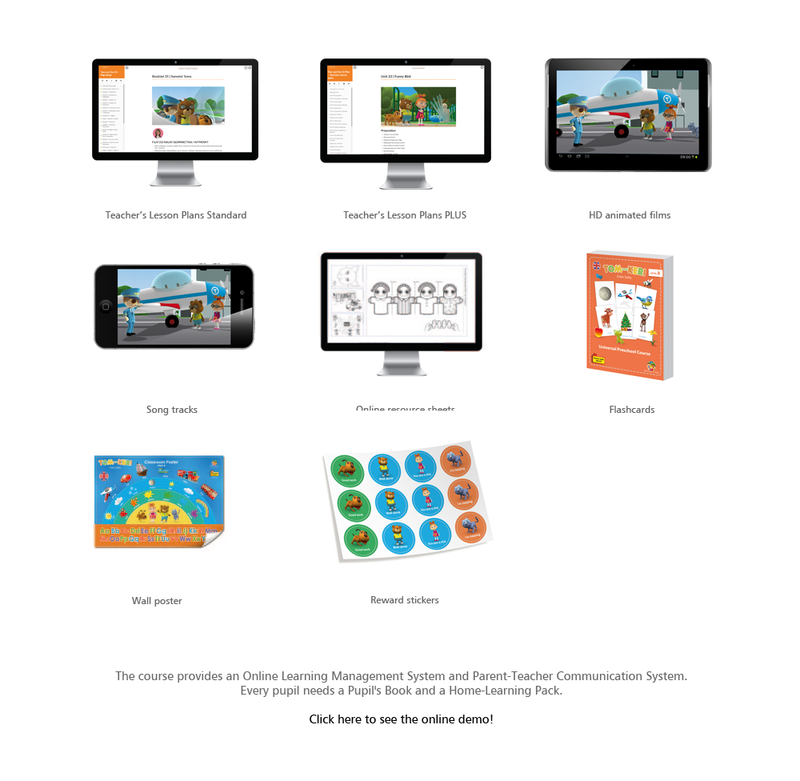 There is a set of Standard Teacher’s Lesson Plans on-screen for any classroom teacher to use and a set of PLUS Teacher’s Lesson plans with advanced lesson activities for expert English teachers to lead. Tom and Keri present over 500 words and phrases in a balanced and age-appropriate syllabus. 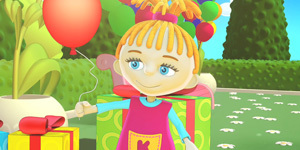 In Level B of the Universal Preschool Course, we meet more new characters and expand the range of topics. The Teacher’s pack for this level follows the established format with Language Presenter film clips that present the new words. The new vocabulary is reinforced in the lessons with pre-prepared activities of songs, games, Pupil’s Book pages and craft outlined in detail on the Teacher’s Lesson Plans. 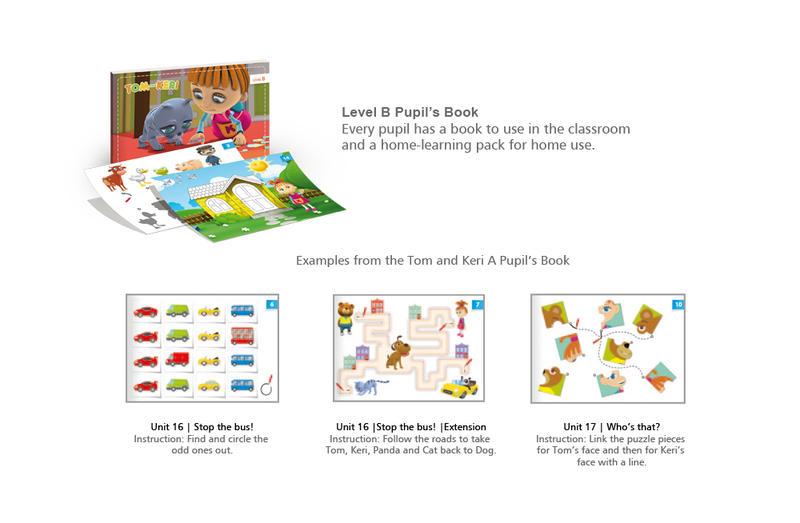 Both the classroom materials and the Home Pack include film, audio and pre-writing content to present and teach the English alphabet in Level B. 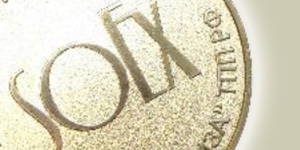 Extra online resources make this course adaptable to almost any classroom circumstances. 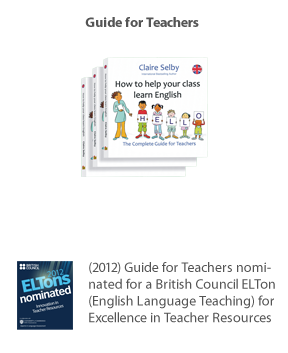 There is a set of Standard Teacher’s Lesson Plans for any classroom teacher to use and a set of PLUS Teacher’s Lesson Plans with advanced lesson plans for expert English teachers to lead. 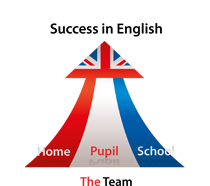 Overall, the course prepares pupils for a bilingual future and gets them ready to start English at school in a gentle, fun way. 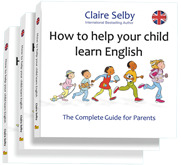 The Guide for Parents: How to help your child learn English by Claire Selby answers the key questions parents ask such as when to start learning, what to expect and how to help. An easy to read guide that can help you through your child's primary years. This guide is included in the Universal Preschool Course pack. Contact us to order the book or e-book. 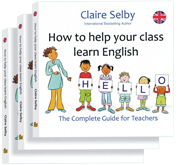 The Guide for Teachers: How to help your class learn English by Claire Selby is divided into three parts. They are: background and method, English in the primary educational context; practical tips on using materials in the classroom. Here is Ring Ring demonstrating the blended learning system at the stand. So many people are interested in online resources – amazing! 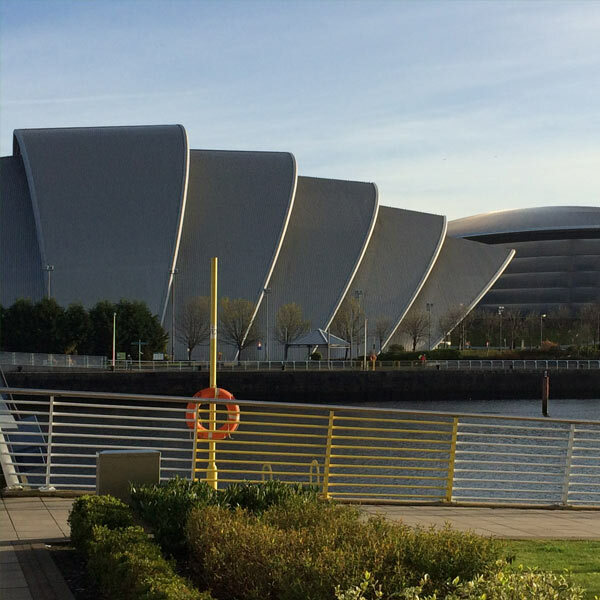 Thank you to everyone who visited our stand at Iatefl Glasgow! More innovation from Yellow House English in 2017! 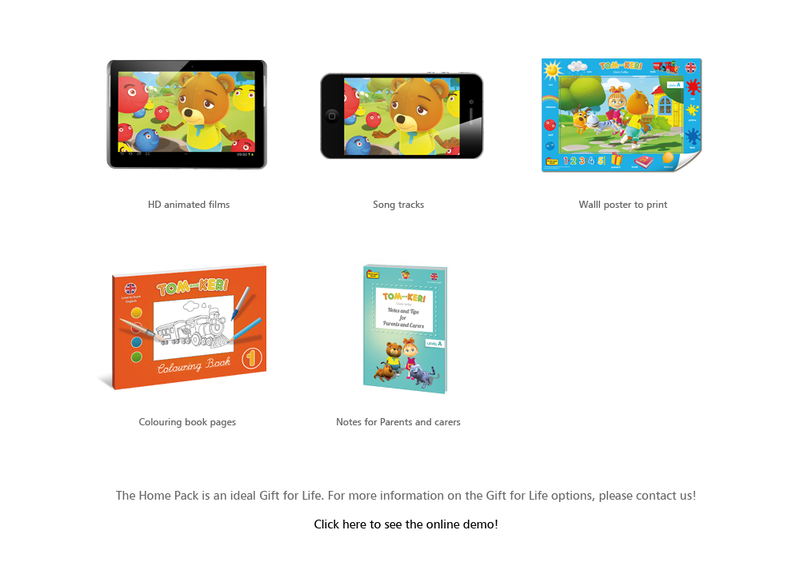 At last – a portal to make English teaching a joy at preschool and at home in the Universal Preschool Course. 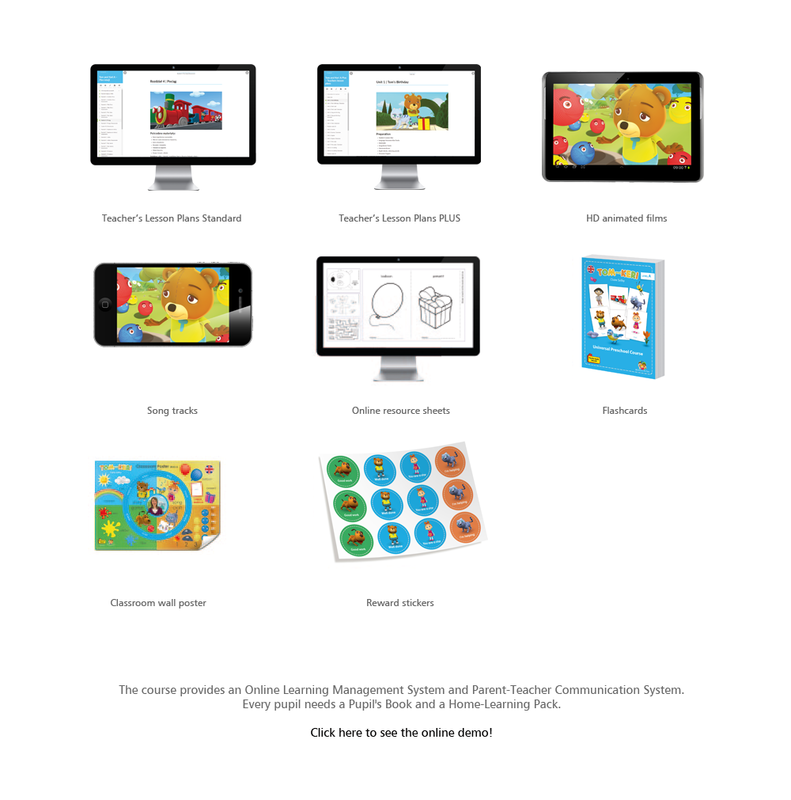 It matches teaching tools to the most effective medium on- and off-screen. See the demo HERE. 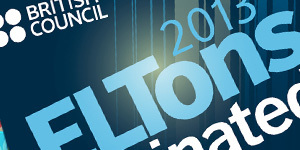 See you at IATEFL, April 2017! 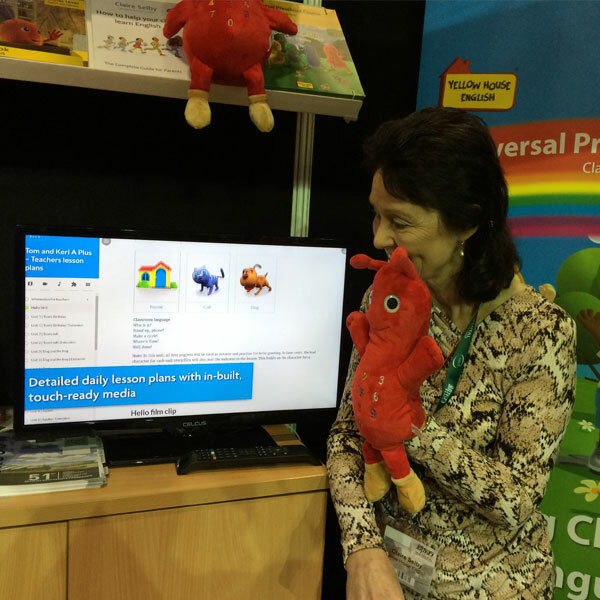 Come and visit stand 98 to try out the on-screen demo, see the puppets and toys and look through the printed iPreschool Teacher’s Sets for all three levels of the course programme. You can also order now for September 2017. PLUS preschool course now online too! You can now buy the PLUS course in the on-screen format too. 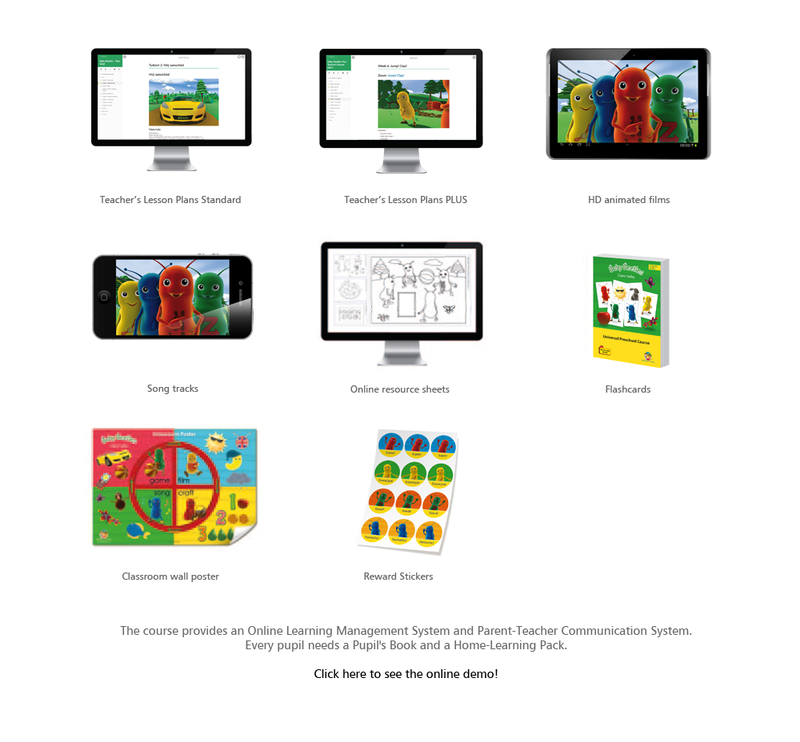 All you need to do is log on and we’ll deliver the puppets and iPreschool Teacher’s Set of printed classroom tools with the Pupil’s Books to you direct. Easy Access preschool course for challenged children – 2017 delivery! 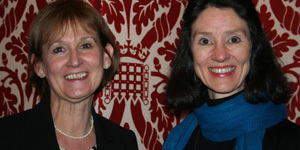 Why should children with learning difficulties miss out on the advantages of a bilingual future? They should have the same chances! That’s why we are launching an Easy Access version in 2017 that is adapted for preschool children with physical and cognitive challenges. Interested? Please contact us now! Perhaps your suggestions can help us make this unique programme even better! Due to demand, online teacher training courses will be launched in 2017 too. Watch this news space for updates!